Cinemas, automobiles, radios and airplanes! Bootleggers, booze, flappers and jazz! The twenties seemed to usher in a new modern age. After the ordeal of the First World War, people were eager to enjoy life in the 1920s and a number of new inventions added to the excitement. This period has been called the Roaring Twenties, but not everyone was roaring. Prairie farmers suffered from a collapse in the wheat market. Many moved to the city in the hope of finding jobs, but soldiers returning from the Great War created a surplus of workers. Those remaining on their farms supported an emerging third party for farmers, the National Progressives. Maritimers were rapidly falling behind central Canada economically and they started a new group, the Maritime Rights Movement, to promote their interests. base metals: any of the nonprecious metals like lead, zinc, iron, etc.base metals. Women, though they were finally allowed to vote, were still struggling to earn decent wages, or get decent jobs. 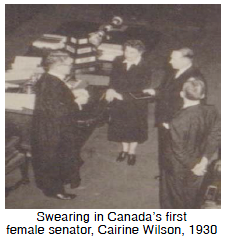 In 1929 women were at least granted the right to be considered "persons" which allowed them to qualify for appointment to the Senate. In the twenties Canada began to see itself as independent from Britain. Starting with Borden at the Imperial Conference of 1923, Canada's prime ministers demanded more autonomy: self-government; independence.autonomy. We began to make our own decisions about following Britain into war and insisted on signing our own treaties and having separate representation on the League of Nations. This mood for independence was used to great advantage by Prime Minister Mackenzie King during the constitutional crisis known as the King-Byng Affair of 1926 which involved Governor General Julian Byng. By the end of the decade Canada was a more complex and diverse country to govern, but optimistic about its future.